Ball quilted jars are a range of 3 different size jars with a elegant old world quilted pattern on them. 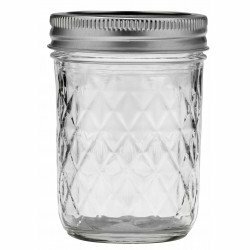 These jars were originally designed as jelly / jam jars but have gained popularity as drinking jars particularly for spirits such as whiskey. They are also used for weddings for floral decorations or tea-light candles. The quilting pattern covers most of the jar with the exception of a clear oval where a label can be affixed. There is no wording or other embossing on the jars. The quilted jars come complete with a decorative lid which are unfortunately unavailable for separate purchase. All the quilted jars take regular mouth, 70mm continuous thread lids. These include all colours of daisy lids, our BPA free one piece silver lids and any other regular mouth accessories. Choose from 4oz, 8oz and 12oz sizes or buy all 3 sizes as a mix and match. All quilted cases come standard as a case of 12, or a half case of 6. 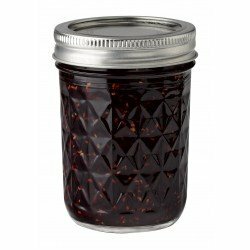 Capacity: 12oz = 340mlSize: 135mm highMouth size: 70mm Regular MouthCase size: 6Suggested uses: chutneys, jams, pickles, small drinking glass, floral displays, candle makingSuitable treatment methods: dry storage, vacuum seal, fermenting, water bath, pressure can, freezeEach jar comes complete with 2 part lid consisting of a flat disk incorporating a seal (the lid) and a twist on ring to hold the lid in place for processing (the band).Lids are recommended for single use only if the jar is heat processed using a water bath or pressure canner.Bands ..